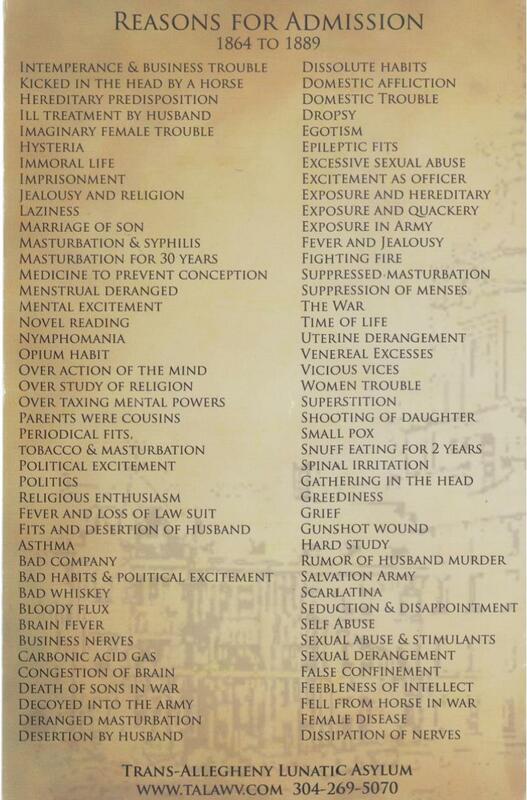 Apparently, people were admitted in the Trans-Allegheny Lunatic Asylum located in Weston, West Virgina, with some not so obvious reasons like novel reading, lazyness or even excitement as officer. According to Snopes, this list is somewhat rooted in truth, even though it is often posted as a joke. It was compiled from the log book of the above-mentioned institution which documented admissions between 1864 and 1889 and has been published or referenced in several books and research papers. It has also been archived by the West Virginia Division of Culture and History. However, these entries recorded the reasons or causes why those patients were thought to have developed their underlying maladies, and so they should be read with that in mind. Yes, mind.